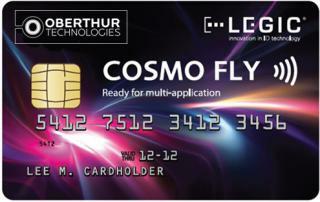 Oberthur Technologies, a French smart card supplier, has rolled out Smart Lumiere, a light-emitting contactless card. Available in both dual contactless-EMV or pure contactless configurations, Smart Lumiere emits light when it is entered in the field of a contactless reader to inform the cardholder when a transaction is taking place. Comprised of a translucent plastic core, antenna and illuminating light apparatus, Smart Lumiere meets ISO 14443 dual interface contactless payment standards. It is the first light-emitting payment card to be ready for use in pilots and has nominated in both the hardware and loyalty categories of the 2009 SESAMES awards. Smart Lumiere is useable in the payment, loyalty, prepaid and transport markets. The color and sequence of the light sources, like the design of the card itself, is decided by the issuer, while the either pure or dual EMV-contactless configurations enables Smart Lumiere to be deployed in major geographic markets at any level of contactless migration. The Smart Lumiere card provides a visual cue to the cardholder that his contactless payment transaction has taken place; helping the bank to reinforce trust in contactless.